Since this photo was taken I have added another row of squares to the length of the quilt to better balance the proportions of the quilt size. 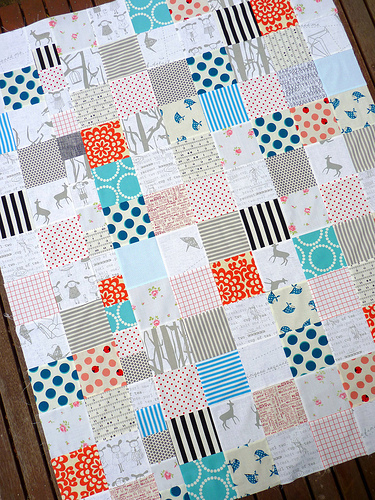 I have also pieced a quilt back with some super cute Sherbet Pips fabric ... and basted. I like to think that I am on the home stretch with all horizontal lines now completed even though they are the shorter quilting rows. Once the majority of the basting pins are removed it does seem to speed things up. Hoping your Thursday is a happy one! It's going to be a beautiful quilt. I love the colours and patterns you used (the Australian fabrics are especially great) and I like the idea of putting a row of smaller squares in the quilt. I had to go and buy some straight away - your quilt is magic! I love how quickly you work while maintaining precision!! I want to quilt like you! 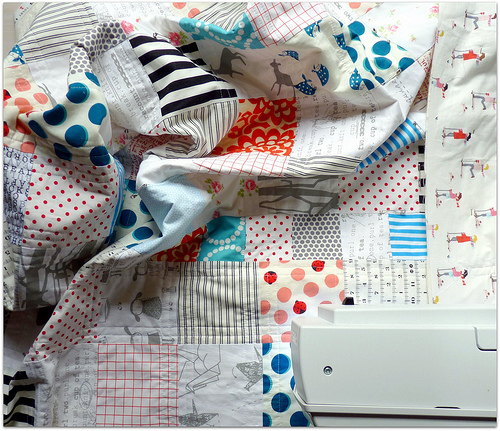 I've been following your blog for a while now and your quilts are beautiful. I wanted to ask you where do you get your inspiration for patterns? Do you work to a specific shape theme or work with the patterns in the fabric or or or :) any thoughts your happy to share would be great. 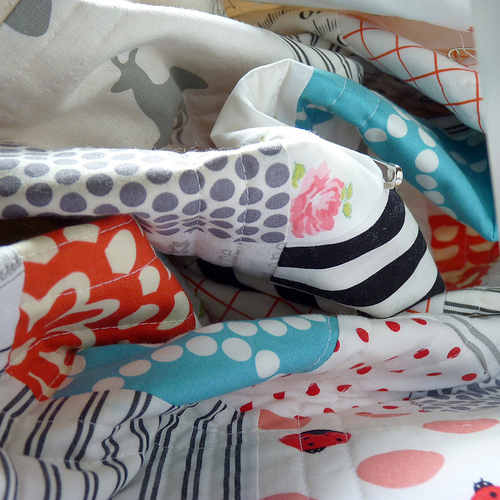 I love that Aunty Cookie fabric, can't wait to see your quilt completed! Your fabrics and colors are perfect! This will be a great quilt! I really like the colors in this one. Even though they are not too bright, they are still lively and fun. Now I must go look at that Auntie Cookie fabric! Nice calming colors. Do you have a picture of the back? You always mix the most interesting prints and colors that I would never attempt -- and they look gorgeous every time. I have just had a long relaxing read of your blog. Really enjoyable. Love your quilts and dedication to the process. Fantastic!